This is a special birthday year, so I decided I’d tick something off my bucket list of places to go – Burgh Island. As you’ve seen from my previous 2 posts on Torquay (check them out here 1 & 2), I’m a big fan of Devon & Agatha Christie. I just keep coming back. 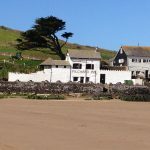 We did stay in Torquay a few days on this trip, but the focus was on Burgh Island. I’ll be posting another blog about what we saw in the areas surrounding Torquay and our recent stay there at a later date. It was absolutely pouring rain when we arrived and our few days weren’t promised much better weather – always a risk in late April, but…. Best gifts on birthdays are the ones given to you, but you can’t hold them, instead you enjoy the moment. Like when a butterfly lands on you – can’t hold them or they will die if you disturb the colours on their back, but it’s such an amazing thing when they do land on you. My gift was the 1 full day we were on the island the weather was perfect – stunningly beautiful! It even started to clear on the day we arrived. Plus, the room I booked – the Cunard Room was stunning! We had the most grand bathroom and balcony with a gorgeous view of the sun rise in the morning. Our 1st night we explored the beautiful Art Deco Hotel – a favourite style of mine. No TV or Wifi in the rooms(except in the lobby/lounge area), but a beautiful Bush retro radio in the 1930’s style. It all set me back in time because this hotel is all about ambience. We napped and read our books while enjoying stunning views of the rain from our huge balcony. The bathroom, alone, is stellar. Apples and chocolates were waiting in our room. There is a turn down service before bed and tea/coffee brought to your room before breakfast. A real pampering! Dinner is a black tie affair with cocktails in the bar before. I tried my 1st Tom Collins – delicious! Such a great night to kick off our stay. 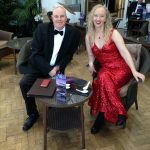 Our 2nd night included black tie with a trio playing songs from the 30’s with the sun set streaming into the dinning room. The food is delicious. Dinner is a 3 course event and breakfast has choice of cooked or buffet. Dinner and breakfast are included in the price of your room. Drinks and lunch are extra. The island isn’t huge, but offers stunning views of the Devon coast. It has it’s own sea feed pool, which you can swim in and there’s a great stroll around it to feel the sea breezes. The sea tractor is a great way to get across when the tide is too high to walk or drive across. The hotel has parking on the main land, so you don’t need it on the island. Oh and for those of you with a helicopter, there is a pad for you to park that on the island. One of our guests was held over the 1st night we arrived, due to the poor visibility, but flew off the next morning – very nice indeed! 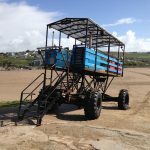 Make sure you look at tidal movements to see when the sea tractor might be going over and check with the hotel to ensure it’s up and running, as it can breakdown. There is a pub by the hotel, Pilchard Inn, if you want a more relaxed drink or baguette at lunch. On Fridays, they have curry night, but you need to book ahead, as it’s very popular with the locals. We were lucky enough to have a chat with the ex-landlord who lives locally. He told us some great stories about his time managing the pub – there’s a pirate face in the fireplace (can you find it? ), dog window seat, and there’s a ghost who throws toilet paper around the pub at night after it’s shut. It just wouldn’t be a pub with out it’s resident pirate ghost! There’s, also, a place in the pub which is for guests only. You can purchase on book on the hotels history in a nearby village – still have yet to read it, but might need a trip back?! 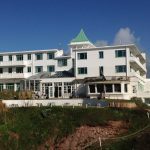 I just loved my stay here – there’s a spa, snooker table, table tennis, TV room/library, puzzles or you can just sit back and enjoy the views with a good book. Gary McBar makes the best cocktails I’ve had in a long time. I bought 1 of the gorgeous wooden puzzles which are not what you expect in a typical puzzle and loved my postcard which I duly sent off to a friend who is also a lover of Agatha. So, what’s the Agatha Christie connection, well she wrote and set Evil Under the Sun there, as well as stories. At the time of writing this article there was a change over to new ownership, I do hope they don’t destroy the wonderful atmosphere of what I experienced, it truly lived up to all my expectations and more!